1. How do I know if I can refill a prescription? The number of refills you currently have available can be located on your most recent prescription bottle label. The number remaining is near the bottom left of the label "Refills:_____". You may also contact the store regarding any remaining refills 208-922-4400. 2. How do I request a refill? You can refill a prescription by calling the pharmacy at 208-922-4400 or on-line. If you are calling after hours please leave your name, Rx #, and a call back number in case we have any questions. 3. When calling in a prescription refill, what information should I provide? Please provide your name, the prescription number(s) you wish refilled (or the name/description of the prescriptions), any over-the-counter (OTC) items you would like included in your order (if applicable), whether you are requesting delivery, and any special instructions or questions you may have. Also please inform us if your telephone number, address, insurance information, or any other pertinent information has recently changed! 4. How do I request refills on-line? When ordering on-line, simply press the Refill Requests link conveniently located on our website homepage. Provide your name, phone number, e-mail address, prescription numbers, pick-up/delivery, and any additional comments your wish to add to your order (i.e. over-the-counter items, special instructions, and questions or concerns). Then press Send Refill. 5. Can my prescriptions become invalid over time? In accordance with FDA regulations, no prescribed medication can be continuously dispensed without renewal. Non-controlled prescriptions are valid/refillable, for up to fifteen months from the date they are written. Controlled substances have a six month maximum refill allowance. CII prescriptions must be renewed every refill. 6. Is it safe to take a medication that is past the expiration date? This is a question that is somewhat debated in the medical community. The general consensus, however, is that some medications may be safely consumed after the expiration date, though potency may be severely diminished. Other drugs like aspirin can even become harmful. We do not recommend the consumption of expired medication. It is in your best interest to simply renew the medication to avoid any unwanted complications. 7. How do I renew a prescription that is out of refills? When calling in refill orders by phone, please be prepared with your Name & Rx # (located on prescription bottle label). If you are out of refills, Custom Rx Pharmacy will contact your prescriber and request a refill on your behalf. Requests generally take between 24-72 hours to elicit a response from your prescriber. If your refill request is an emergency, we recommend that YOU contact your prescriber as well. We also accept refill authorization requests verbally or on-line . 8. How do I order a prescription that was filed for later use? Prescriptions that have been put on file for later use may be ordered by phone or on-line, just as you might a normal prescription. However, instead of giving us the prescription number, please just provide the prescription name (or a description if you do not know the name) and let us know that it has been put on file. 9. I am a new patient, what information will you need? Thank you so much for choosing us - you won't be disappointed! To serve you as efficiently as possible please be prepared to provide the following information: your name, address, phone #, birthdate, allergies, insurance information (if applicable), and whether or not you would like to have any prescriptions transferred to us from another pharmacy. Also, please provide a complete list of other medications and supplements you are currently taking so that we can check for potential interactions. 10. How do I go about having a prescription transferred? If you would like to have a prescription transferred to Custom Rx, just contact us and provide the following: your name, address, phone #, birthdate, allergies, insurance information (if applicable), the name and phone # of the pharmacy you would like the prescription(s) transferred from, and your prescription number(s) or try our prescription transfer form. If you are transferring a prescription from Custom Rx to another pharmacy, please have the transferring pharmacy contact us via phone 208-922-4400 or fax 208-922-4499. Please note that not all types of prescriptions are able to be transferred while others may only be transferred one time. 11. Can you help me with drug and insurance-related issues? 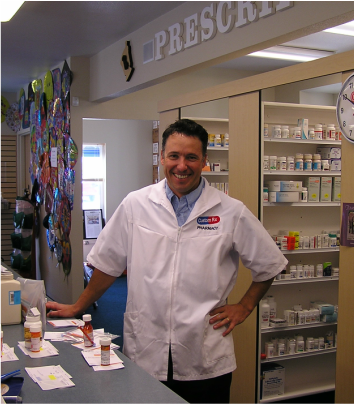 Custom Rx Pharmacy staff can generally provide on-site consultations anytime during normal business hours. Longer individualized Medication Therapy Management (MTM) services can be scheduled by appointment. Although insurance problems are probably best directed toward your insurance company, our pharmacists will be happy to assist you with their wide range of experience and expertise. 12. How does delivery work? Custom Rx Pharmacy provides an inexpensive delivery service for those without transportation, or even to those who just don't have time to stop by the store. You may request delivery during all order methods, whether via phone or on-line. Local delivery Kuna, Meridian, Boise, Eagle, & Nampa is FREE! No delivery is charged for individuals living at nursing homes! Delivery is available Monday through Friday - same-day deliveries must be placed before 1:30 PM on weekdays. Orders placed after 1:30 PM may not be delivered until the following weekday. 13. How can I pay for my delivered prescriptions? Payment is accepted as VISA/MC/DISCOVER/AMEX. If you wish to pay with cash let us know the denomination you will be paying with so our driver can bring the correct amount of change. Custom Rx also accepts checks accompanied by an Idaho Drivers License. If you have special delivery instructions (i.e. what door to use, gate codes, calling before we deliver, etc. ), please let us know when you place your order. 14. I requested to have something delivered; when can I expect delivery? Prescriptions ordered prior to 1:30 PM on week days can be expected to be delivered the same day, providing there are no difficulties filling your prescription. Difficulties may include waiting on physicians to authorize refill requests, out of stocks, compounded preparations, etc. The majority of deliveries are made between 2 and 6 PM. If your delivery is an EMERGENCY, please let us know and will do our best to accommodate you . 15. What if my question was not answered on this page? We would love to hear from you and will happily respond to any questions, concerns, issues, or anything else you require via phone, e-mail, or on-site consultation. We are here to help!